The Georgia Club Real Estate Company, Inc. has sold more homes in The Georgia Club, a private golf community, than any other company. For years, The Georgia Club Real Estate Company sold homes exclusively through the Georgia Club, but in 2018 they stepped out as an independent real estate company. I created an elegant, easy to navigate website to showcase their available homes, floor plans and neighborhoods. The Georgia Club Real Estate Company sells homes primarily in The Georgia Club, a private golf community located close to Athens, GA, but also sells homes in the surrounding Oconee, Barrow and Jackson counties. 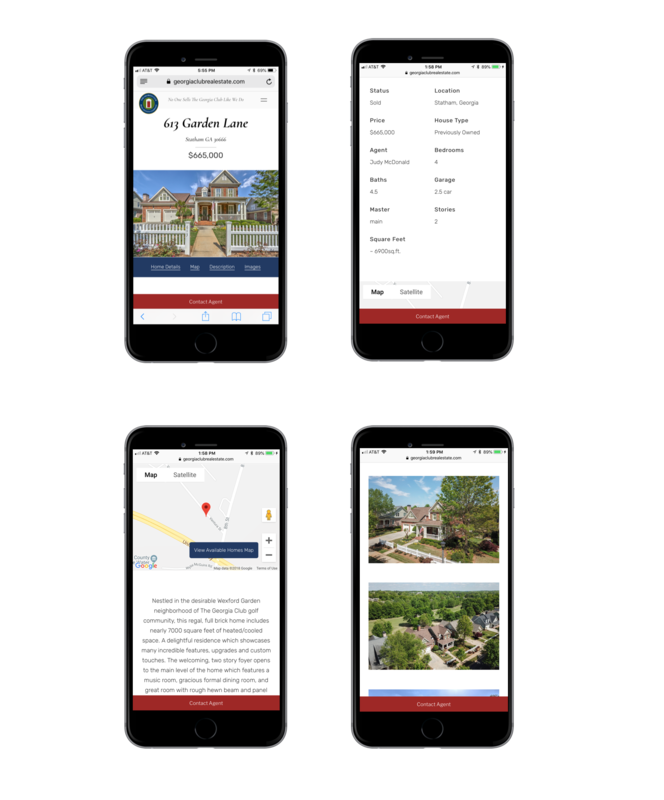 The Georgia Club Real Estate Company website features their available homes for sale, floor plans and Georgia Club neighborhoods. When selling homes in The Georgia Club, you are not only selling a home but also a lifestyle. 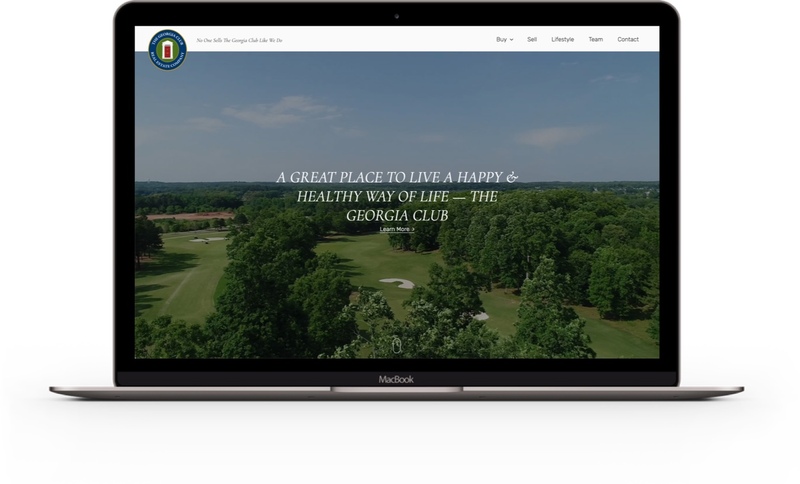 The website promotes The Georgia Club lifestyle through images of their scenic grounds, neighborhoods and an informative ‘lifestyle’ page. 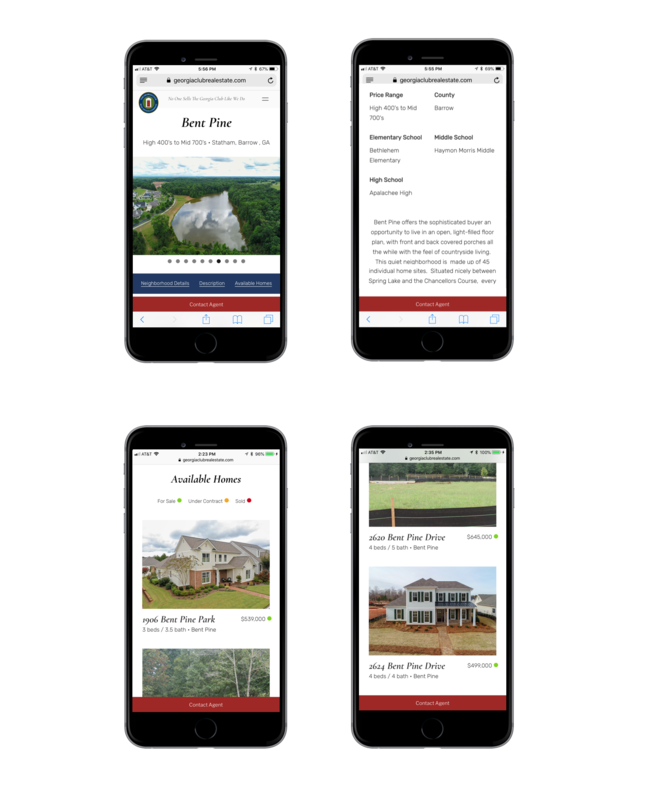 The available homes section of The Georgia Club Real Estate Company website features an advanced search at the top of the page so users can filter the available homes to their specific needs. 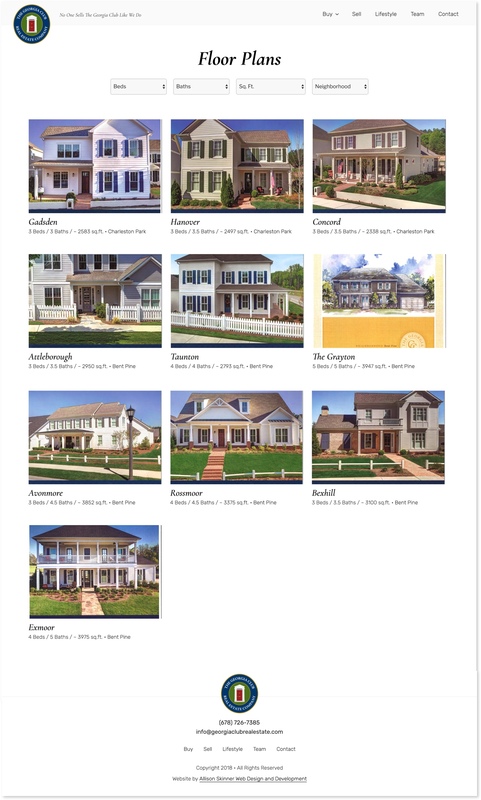 There is also a link to the ‘available homes’ map that provides a map view of all the available homes at The Georgia Club Real Estate Company. 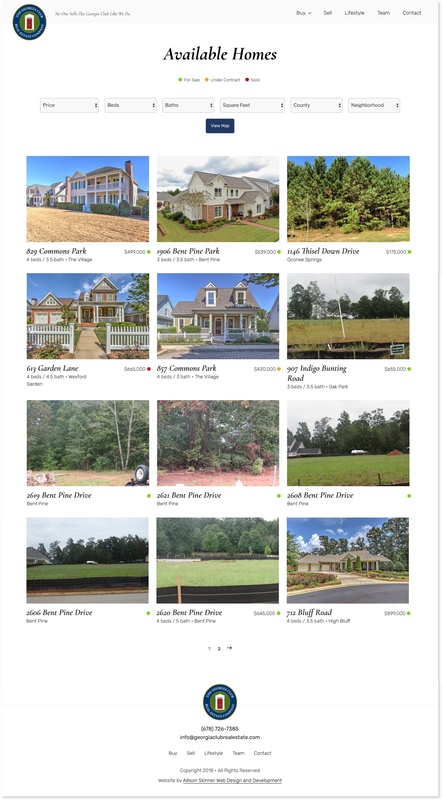 In the available homes feed, each home has an informative preview that features an exterior image, street address, price, bedrooms, bathrooms and the Georgia Club neighborhood. I’ve also included a color-coded ledger for the house status (available, sold, under contract), so prospective buyers can quickly filter through the properties. The individual available home pages features a wealth of information for prosepctive buyers. At the top is the street address, price and main exterior image. Then there is a grid of important information that shouldn’t be lost in a paragraph of text, such as bedrooms, bathrooms, location, square feet, house status, etc. Below the grid of important information is an interactive google map showing users exactly where the home is located. Then there is a two-column masonry grid of additional images of the home. If you click on any of these images a pop-up lightbox slider will appear, so you can scroll through all the images. Each neighborhood in The Georgia Club is unique. Some neighborhoods have smaller homes with walkable streets and paths, perfect for those in retirement, while other neighborhoods offer larger homes and multiple acre lots for those raising families. Each neighborhood has a distinctive architectural style and layout. The Georgia Club Real Estate knows each neighborhood intimately and can help prospective buyers which is best suited for their needs! For the single neighborhood page, I’ve included a rotating slideshow at the top that features multiple images of the neighborhood. Below, is a grid of important information, such as price range and school districts. Below the neighborhood description, is a feed of available homes in the particular neighborhood. This is a helpful feature for prospective buyers that want to be in a specific neighborhood. 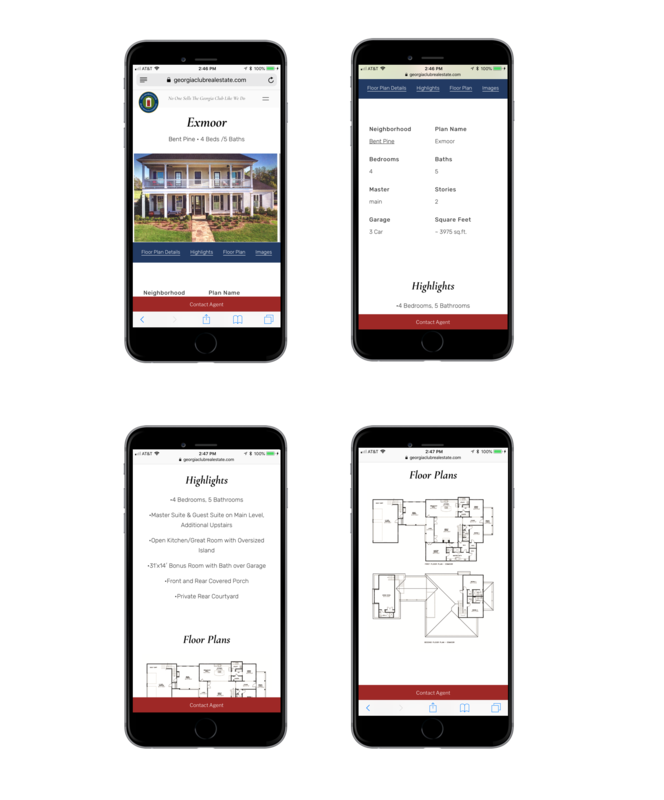 The Georgia Club Real Estate Company website includes floor plans that are used for many of the Georgia Club homes and neighborhoods. The floor plans are especially useful for those buying empty lots. This can give prospective buyers ideas of the types of floor plans they could have constructed on available empty lots. The main floor plans feed features an advanced search for those that want to filter their options. 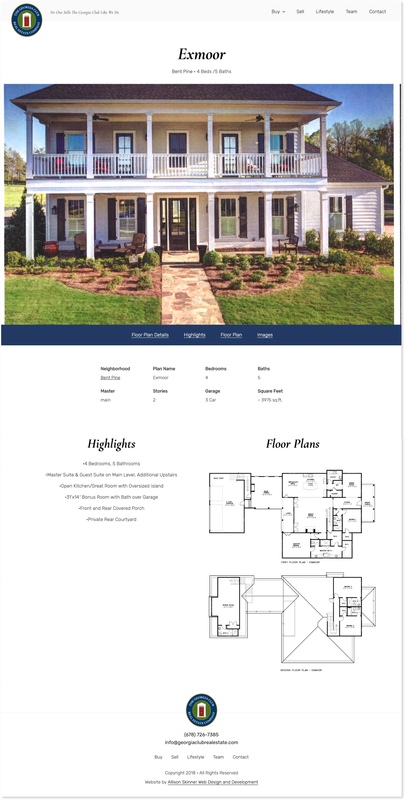 It also provides a preview of all the floor plans, including an image, title, beds, bath, approximate square feet and neighborhood. The individual floor plan page features important details such as beds, bath, square feet and neighborhood. The individual floor plan page also features the highlights of the floor plan and blue prints of the floor plan. Most people buy homes in the Georgia Club because they want to become a member of the Georgia Club community and become active in the Georgia Club lifestyle. For those curious about the perks and amenities provided at The Georgia Club, The Georgia Club Real Estate website features a ‘lifestyle’ page that offers a wealth of information. The lifestyle page includes information on health and wellness, learning, the Georgia Club Foundation, community garden and gathering places. Each section has an accompanying slideshow of images.